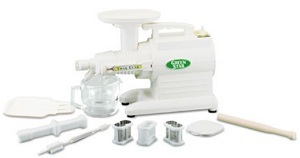 The Green Star 2000 Jucier is a twin gear juicer that can churn out juice rather quickly. While it is far from the cheapest juicer on the market today, it does have a lot of strengths working in its favor. Let’s get into all of its features to see where it sits in today’s very crowded juicing market. Works very well with harder fruits and vegetables others may struggle with. Convenient design is easy to move around and store. Can turn in reverse to unclog without stopping the juicing process. The ability to move the machine around the kitchen easily and quickly will be very convenient if you have a smaller kitchen or won’t use the machine daily and want to put it in a storage area. The ability to operate the machine in reverse is equally impressive. This allows the machine to back up and unclog itself when pulp or skin gets caught and jams the machine. Models that don’t go in reverse are more difficult to operate because you have to stop juicing to clean out the clog. Another perk is the fast and easy clean up once you are done juicing with the Green Star 2000 juicer. Does not work well with softer fruits and vegetables. Cannot juice wheatgrass and leafy green vegetables. Does not form dough very well, despite manufacturer claims. The big complaint tends to be that the machine doesn’t perform well on all of the tasks it is advertised to perform. It’s not that the machine won’t do these extra duties, but that it isn’t as efficient at them as it is at juicing. This is understandable since it is primarily a juicer with some extra features, but you can buy some masticating juicers that do perform these other jobs efficiently so keep that in mind. It is advertised in some places that you can juice wheatgrass with the Green Star 2000 juicer, but the machine really is not very efficient with this type of fine, leafy vegetable. This is not a flaw of the Green Star 2000 juicer alone, but of the centrifugal style juicer as a whole. If you want to juice wheatgrass, spinach, and similar vegetables, either purchase a separate wheatgrass juicer or go with a masticating style juicer that will be more efficient with these greens. The Green Star 2000 juicer is a good pick as long as you understand its weaknesses. It is primarily a juicer and should be used mainly for that purpose. If you do want a juicer that can also grind, chop and do other things, you will be better off with a masticating juicer. The design of those machines is simply more efficient for those other duties.